The wait is over. 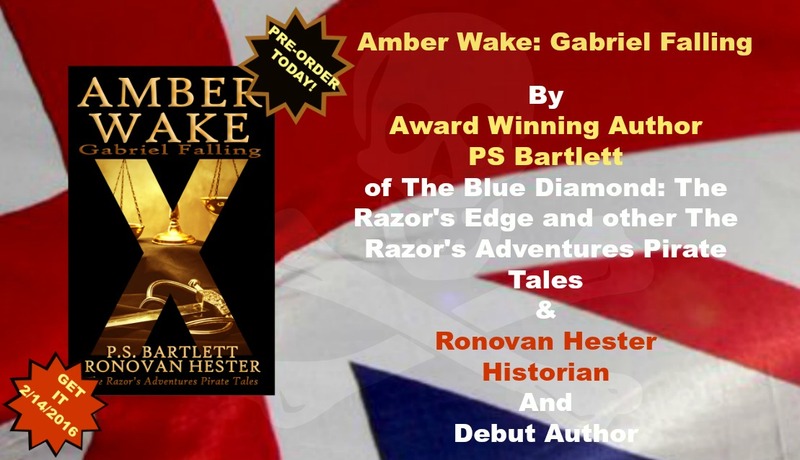 My debut novel Amber Wake: Gabriel Falling, written with Award Winning Author PS Bartlett is available for Pre-Order Now! The Prequel to all of the The Razors Adventures Pirate Tales, of which there are currently 4 titles with another in the works if not already on the way. It’s been a long year of nervous excitement on my part, waiting for this week. My big goal in writing this book was to become a published author. Sounds like a duh type of thing, right? Well, it’s not for the reason you think. I worked hard, even agonized over my creations, because I wanted my son to be proud of his daddy. Two and a half years ago I suffered a fall in my home. As a result I ended up with a Grade 3 Concussion, and the discovery of multiple herniated discs in my spine beginning with my neck. There are a lot of other problems, but that’s enough of that story. My son has been tough through it all. Considering he’s 11 now, it’s been difficult for him. Now he has something he can tell his friends that his daddy has done. Now for the book, right now PS Bartlett and I have a good price set for the Pre-Order phase. She is even lowering the prices on her other books in the series for a short time. Of course those prices won’t always be that way. Help us get to the top with my debut. That would put a surprise of an ending to this little story of mine. Not really an ending. I’m still writing. It will be one great thing though. Visit Amazon to Pre-Order. Here are a few to click to now. And wish my son good luck with his baseball tryouts in Little League coming up Saturday. Maybe he’ll have someone who can catch better than I can. This past Saturday I suffered my first black eye ever. I might resort to an eyepatch if any photos are needed for guest spots during book promotion.